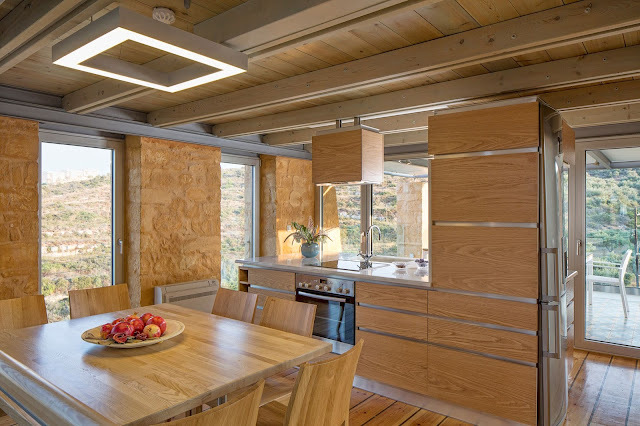 On our recent trip to Crete we had the opportunity to stay at the Olea villas, which are set amongst olive groves facing Loutraki Bay, near Chania Crete The villas are fully equipped with a modern kitchen with all mod cons, crockery and cooking utensils if you want to do self catering. 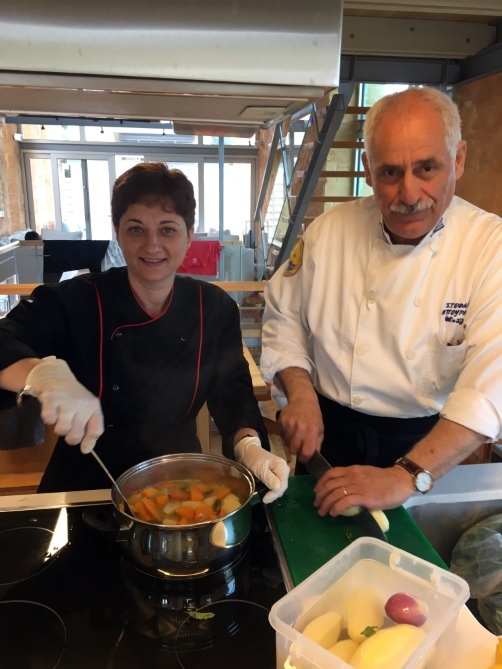 However for those who go on holiday and want total relaxation you can even arrange for a private chef to come and cook a Greek feast for you. It was really interesting to watch him create some regional Cretan dishes made from scratch. 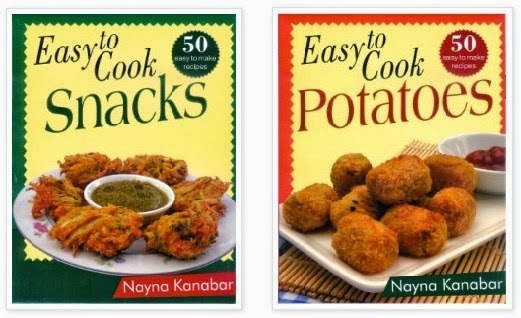 Being a vegetarian I was amazed that almost every dish he made was meat free and I was able to sample them all. 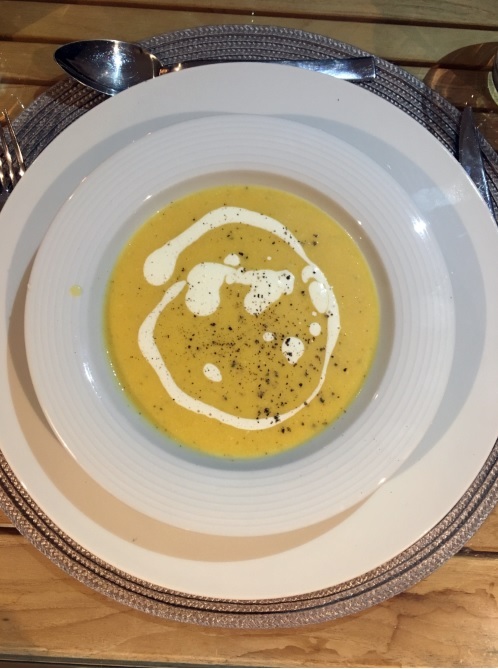 For starters we had butternut squash soup - Kolokythósoupa. I had a hands on cookery lesson from Stefanos. He sauted onions in olive oil, once the onions were translucent he added the butternut squash, carrots, potatoes in white wine. Once the vegetables were cooked he seasoned it with salt and pepper and added Mytzitahra cheese to it and blended it to a smooth puree. A finishing garnish of Greek yoghurt and cream were added before serving. We really enjoyed our candle light dinner on the terrace overlooking Loutraki Bay. The soup followed with a plate of Kolokithakia Tiganita or Deep Fried Zucchini (courgettes). Wafer thin slices of zucchini are soaked in water for half an hour after which they are towel dried. 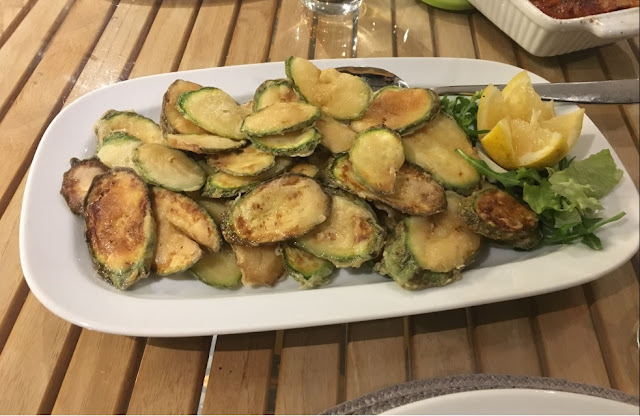 The zucchini slices are then tossed in a seasoned flour to coat them before deep frying them until they are crisp and golden brown. These are so delicious with a squeeze of fresh handpicked lemons straight from the lemon groves. After enjoying these two wonderful starters there was more to come. 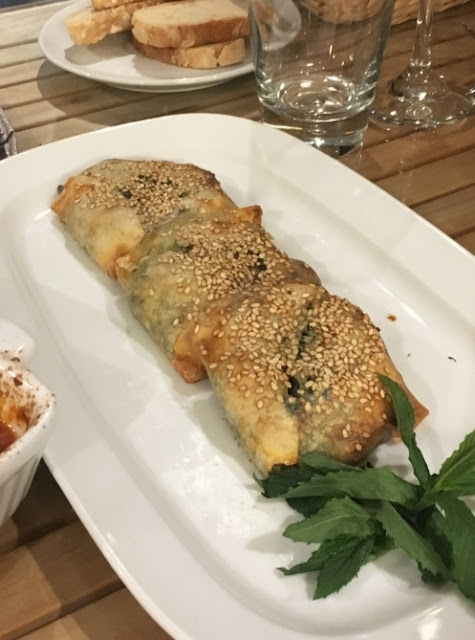 Stephanos made us these delectable spinach parcels called Kaltsounia. Greek phyllo pastry filled with spinach and Mytzitahra cheese and herb filling and then shallow fried till until they are golden brown. They are finished with a coating of sesame seeds. 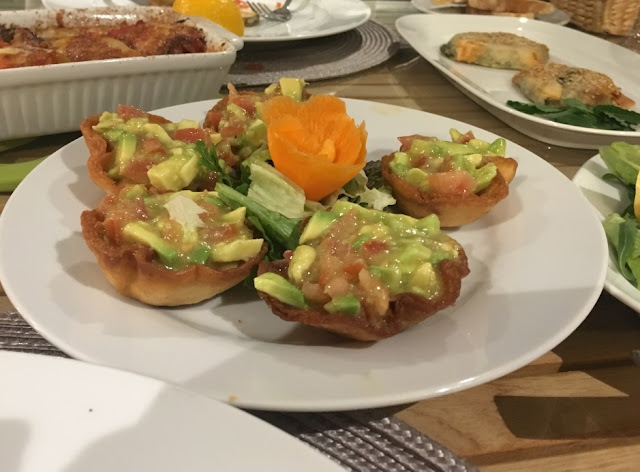 These were served with mini pastry tartlets filled with an avocado salsa. When we thought that we had finished, how wrong we were there was more to come!!! 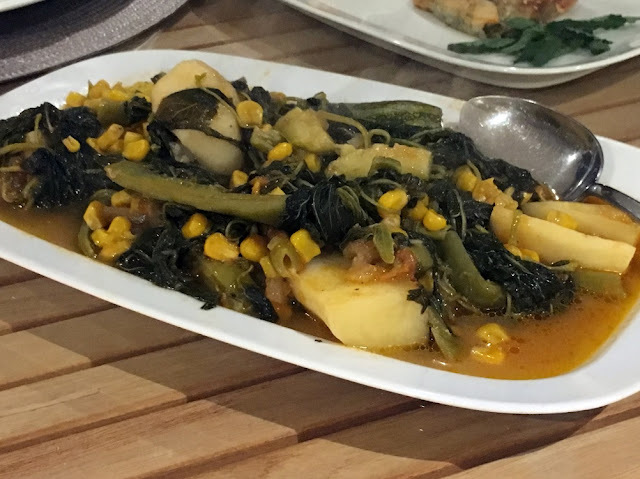 For the main course we had Simbetherio (συμπεθεριό).This is a type is the Cretan vegetable stew cooked with a medley of seasonal vegetables on the stove top. The meaning of 'simbetherio' comes from the relationship of the parents-in-law of the two members of a marriage; the families become related to each other through marriage (they are 'simbetheroi' to each other). The simbetherio dish uses the extended family members of various similar species, cooked in the same pot. This dish had potatoes, peppers, mushrooms, courgettes, tomatoes, aubergines and had a garnish of Mytzitahra cheese. Simplicity at its best!! To accompany the Simbetherio, we had Melintzanes Stolismenes these are thin slices of eggplant shallow fried and rolled with feta. 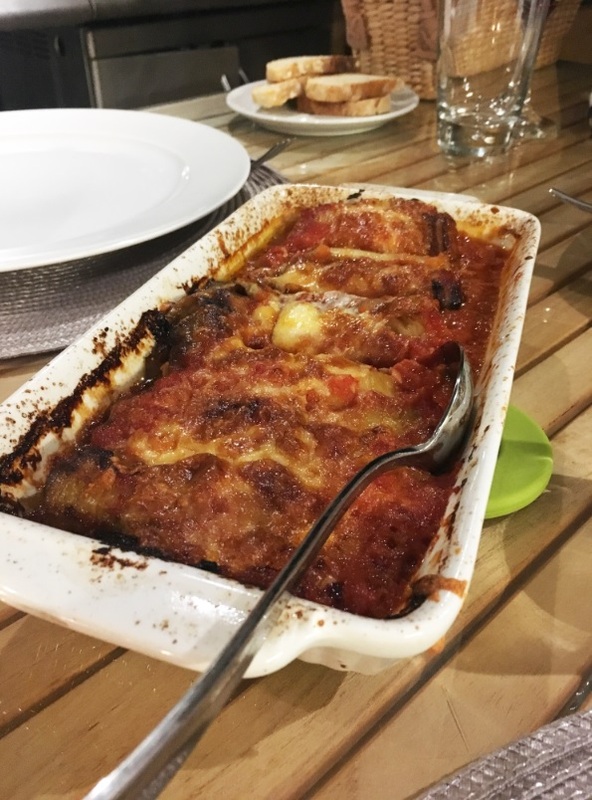 The eggplant rolls are layered in an ovenproof dish and topped with a spicy tomato sauce and Keseri cheese. The dish is baked in the oven until the cheese is golden brown and crisp. 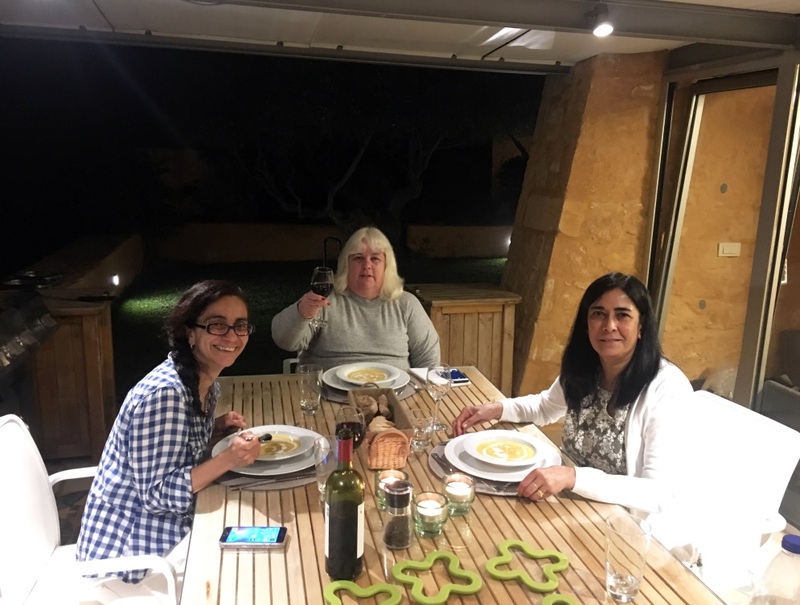 After this incredible Greek gastronomical feast, our stomachs were aching from the fullness and ready to explode, but there is always room for dessert!!! 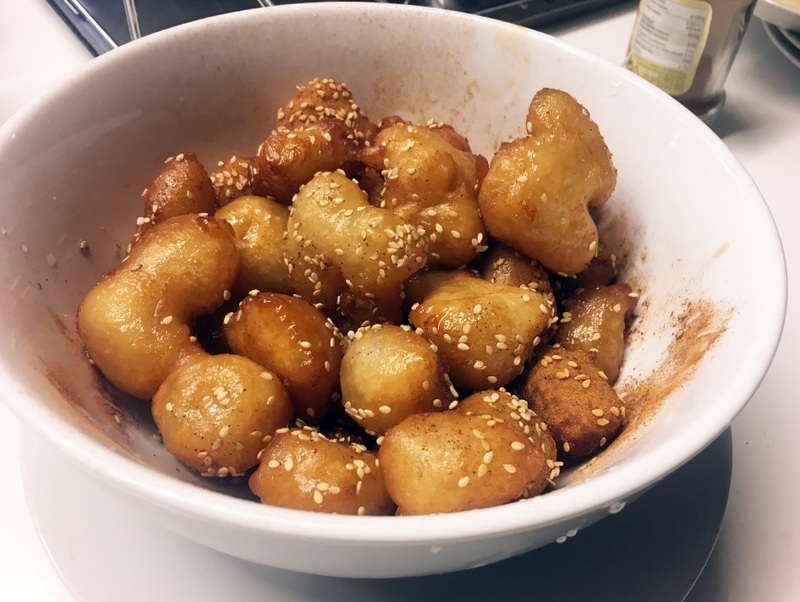 So for dessert Stephanos made us these delectable little deep fried Greek honey and sesame coated balls call Loukoumades. They were really delicious and the perfect end to this Greek Feast. I would like to Thank Stefanos and his wife for spoiling us rotten by creating such a wonderful banquet for us. 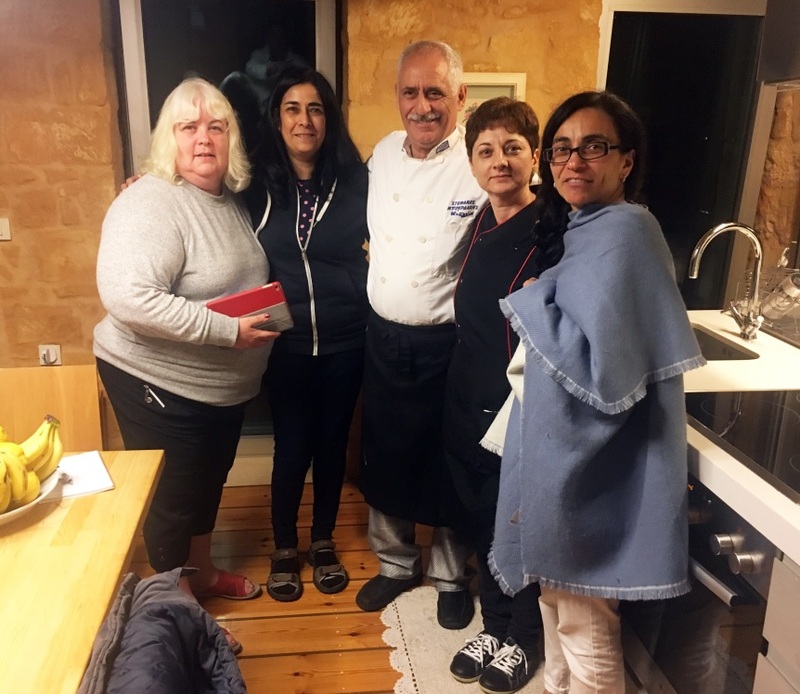 We were totally transformed into a food journey through Greece with all the flavours and dishes. In the picture Heidi Roberts, Katilena , myself, with Stefanos and his wife. All the dishes were different and mouthwatering. 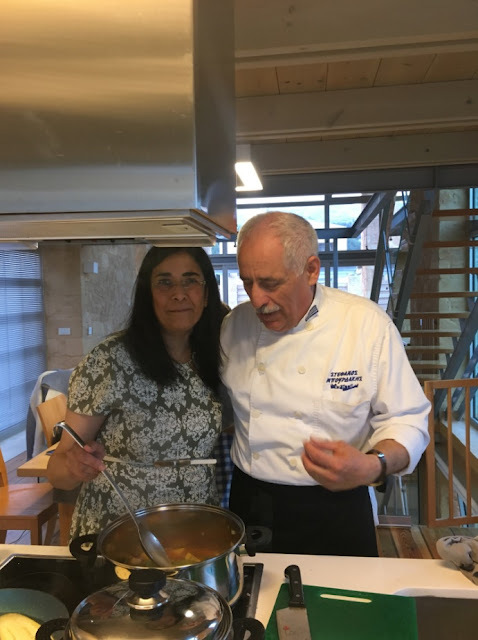 Oh wow, I love greek foods and ate plenty on my recent trip to Athens, having a personal chef when traveling is always a highlight of any trip. It was definitely thehighlight of the trip. They were my favorite dish too. The squash soup looks amazing and I have never tried fried zucchini. I need to give it a go! They tasted amazing with a squeeze of lemon juice. Oh come on that's not fair! Now I am dreaming of kolokithakia! 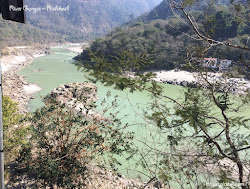 Such a nice place! I am from Rethymno btw. The food was amazing . I love Greek food and so does my daughter. (I think that comes from having been there when I was pregnant!) I was vegetarian on my first trip to Greece and there was so much choice. It was still pretty good going there as a vegan, but I'd love to go back during lent when there is a lot more vegan food about. What a gorgeous feast! I'm loving the look of those fried courgettes - I'll have to try that this summer as we get so many courgettes in our veg box. We've never been to Greece before but it is on our potential list for this summer. The food looks great in particular the soup! I have never been to Crete, but I would love to go! And having your own personal chef sounds amazing. I have always loved Greek food and I think it would be a nice treat to have a feast like this! It's so lovely! Greek Fest looks amazing. I love all of those food choices you were able to indulge in. 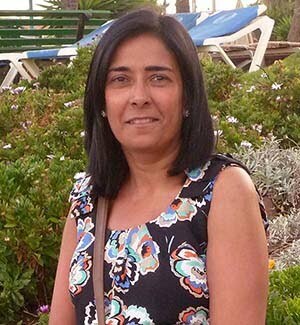 Great that you could share your experience with us! I like the idea of having a personal chef. The food looks yummy, especially the dessert. Everything plated looks amazing. Thanks for sharing! I adore greek food because I am Cypriot! It just makes me crave homestyle cooking looking at this post. I am an Indian but I love Greek food. These not only look tasty but it makes me miss Greek food. Wow, that's so amazing that the chef cooked for you. All the dishes are so mouthwatering and perfect vegetarian's delight. Greek food is really so good.. 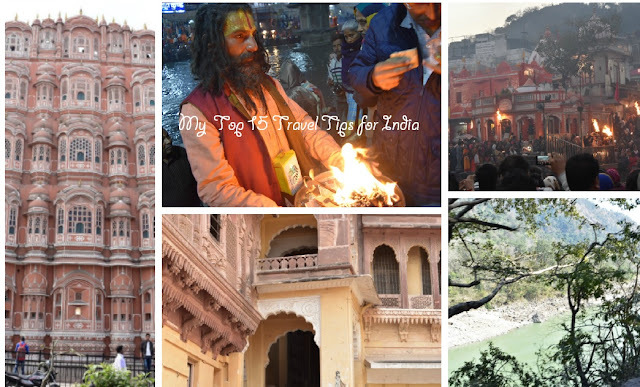 I had enjoyed during our trip few years back. Wow - sounds like my kind of heaven. Lovely holiday plus food cooked by a personal chef!! All the dishes look so delicious as well as healthy. All the dishes look so delicious! I would love to go on a gastronomic tour like that. Happy times are when my tummy is happy! Crete is the place to be!